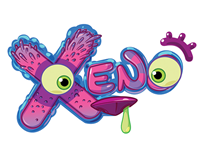 If your kids love monsters, burps, farts and snot (and not necessarily in that order), they will adore Xeno! Xeno is a baby monster who loves to play and dance to music, and above all, loves to be tickled. With over 50 eye expressions, 80 sounds and 10 different emotions, Xeno will quickly become your child's best pal. And he's got extra tricks to unlock if you download the free app too. We think the Xeno interactive toy is going to be very BIG this Christmas! Xeno is a great little bundle of fun for any child, with all sorts of hidden emotions and interactive elements to discover. And when he sneezes, pull his nose bogey! Kids can download the app and watch their Xeno interactive soft toy mimic what's happening in the app for hours of monster fun. We simply adore Xeno and we're pretty sure kids will love him too!